Allegiant falls into the insanely popular YA (Young Adult) Dystopian Sci-Fi category. As such, it shares common themes with Big Sister The Hunger Games and Big Brother The Maze Runner. Although similarities to The Hunger Games are more superficial than substantive (despite Tris coming across like a diluted version of Katniss), the Divergent series tracks closely enough to The Maze Runner to create confusion in the minds of the unconverted masses. Both tell essentially the same story, albeit with variations. Also, like many YA franchises, Divergent has elected to split the final book of the trilogy into two movies. The result? The motion picture Allegiant tells only half the story presented in the novel Allegiant. Viewers will have to wait 18 months for Ascendant to see how it all ends… if they still care by that time. To be fair, unlike Breaking Dawn and Mockingjay, Allegiant has the decency not to conclude with a cliffhanger. The movie feels like it ends rather than merely stopping. [Spoilers for the previous installment, Insurgent, follow.] Allegiant’s storyline is half-retread, half-filler. Like Insurgent, the plot focuses on having Tris (Shailene Woodley) and her posse - lover Four (Theo James), brother Caleb (Ansel Elgort), bff Christina (Zoe Kravitz), and frenemy Peter (Miles Teller at his snarky best) - escaping from Chicago then finding their way back again. (I have done that a time or two myself.) One of the problems with Allegiant is that, lacking a credible Big Bad Guy, it needs to invent a new one. That’s what happens when you kill of the villain at the end of the second film. Poor Jeff Daniels is given the unenviable job of filling Kate Winslet’s shoes. They don’t really fit. We know Daniels’ David is up to no good the first time we see him. It’s something about the insincere smile. So, after he turns out to be less of a savior and more of a Donald Trump-type, Tris and her friends are running away from him and back toward Four’s mom, Evelyn (Naomi Watts). Meanwhile, snake-in-the-grass Peter is up to no good but, hey, he’s not really bad, he’s just misunderstood. And, after being mistreated by Oscar winner J.K. Simmons, we can’t help but feel sorry for the guy (although some of that sympathy goes away on consideration of Fantastic Four). Allegiant tries to cram too little story into too much time. This results in dead spots and uneven pacing. Some stretches are painfully dull with canned dialogue and lifeless character interaction failing to liven up the proceedings. Whatever happened to the smoking chemistry between Shailene Woodley and Theo James that made parts of Divergent so giddily fun? Now, they’re like an old married couple, comfortable in each other’s presence but with minimal evidence of sexual attraction. It’s as if, having established everything in Divergent - the setting, the people, the situation, the creative minds behind the series have coasted on those beginnings. Not having read Veronica Roth’s novels, I can’t say if this is a fundamental issue with the source, but the result on screen is unsatisfying. Thankfully, Summit Entertainment has abandoned the 3-D experiment it tried for Insurgent. 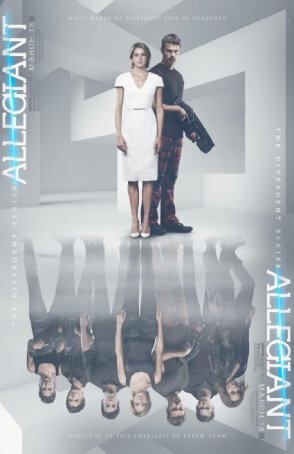 Visually, Allegiant is all the better for it. Schwentke’s interpretation of a post-apocalyptic Midwest isn’t original but at least it isn’t muddied by poor post-conversion 3-D. The special effects are limited - competently done but not eye-opening. Aircraft design, for example, is generic sci-fi 101 (although the ships’ ability to protect passengers during crashes is impressive). Potential viewers of Allegiant can be divided into three groups. The first, fans of the novels, will see the film regardless of how “good” or “bad” it is and their interpretation will be based on how well it matches the images they have created in their minds based on Roth’s writing. (Although I have heard there’s a lack of love among readers about the novel Allegiant.) Then there are those who haven’t see one or both of the previous productions. There’s nothing here to encourage them to re-think things and climb on board. Finally, there are those who haven’t read the books but have seen the previous movies. Allegiant is most likely to disappoint them because of its lack of vision and direction. The franchise feels stalled and there’s nothing here to generate anticipation for the next (and last) installment. It’s as if the Divergent series has already ended but the filmmakers haven’t recognized it.